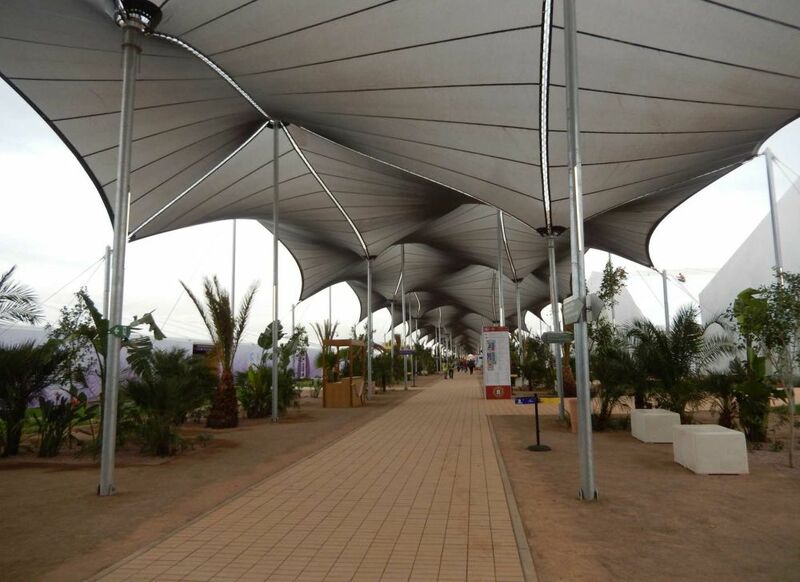 Within the world congress on climate change that has taken place in Marrakech, the COP 22, IASO has covered with a tensile structure the central boulevard. Eleven days of meetings and analysis where Heads of Governments from the five continents will congregate, during the second week of the summit, in order to discuss the immediate future, besides to what has been learned and ratified by the Paris Agreement which has already entered into force. It is an important event in terms of defining future actions on climate migration. The venue where the COP22 event takes place is based on a distinctive style that reflects the Moroccan architectural experience. A space of 68,000 square meters divided into several pavilions, where the conferences take place, all of them are joined by a corridor of more than 18 meters wide by 684 meters long. Covered by a structure with a large tensile PVC cover. The structure stands out for its irregular geometry and for the mesh fabric with laminated transparent PVC. The fabric acquires an important role in this work because of its impermeability and the transparency of the PVC, which make it more transparent than a dense fabric. The characteristics and the composition of this fabric offer a diffusion of colours, which makes it more beautiful when viewed from the inside. This project started from a premise; that the structure has to be quick to be fabricated, installed and at the same time reusable. The architecture department of IASO achieved the goal in only 3 months; by designing, fabricating and installing the tensile structure which allows to be reused in other locations. IASO was able to fulfill the proposal of this work thanks to the methodology of Integral Project. This method allows for greater coordination with all processes and makes the production and assembly chain more effective and faster. On 18 November, the 22nd "Conference of the Parties" was ended, and it welcomed representatives from 197 countries.